This sweet potato bread healthy is loaded with all the goodness of whole wheat flour and Sweet potatoes. Remember my recipe of baked sweet potatoes, I still love doing it often. But this is my first ever experimental bread with sweet potatoes. Using the goodness of vegetables in my recipes of bread is something that I love doing. This increases the nutritional value of the bread and enhances the flavor too. 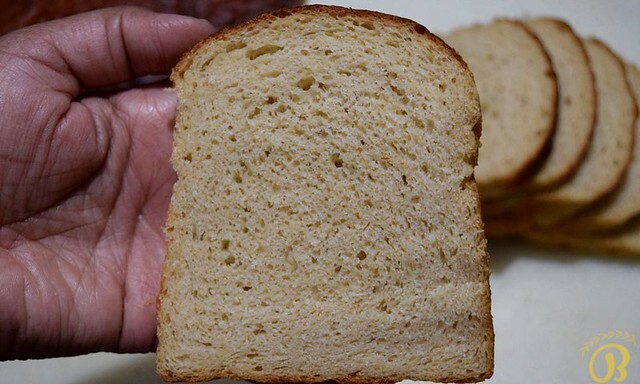 Not just the vegetables, I also like to experiment with different spices in my bread and Sambhar Masala Semolina Bread (SMS Bread) is an example of the same. I have been advocating the benefits of eating whole wheat in most of my recipes and in my healthy baking workshops too. But today I will talk about the health benefits of sweet potatoes and you will understand why I am excited about this sweet potato bread. It is a starchy root vegetable and usually found in four different colors: Yellow, White, Purple, and Orange. What are the benefits of eating the sweet potato? Sweet potatoes are a good source of fiber as well as vitamins and minerals like Iron, Calcium, Selenium, Vitamin B and Vitamin C. The most important fact about sweet potato is that they are high in antioxidants. According to a study by Food & Nutrition Research Purple sweet potato contains a specific group of antioxidants which are beneficial for the eyes. 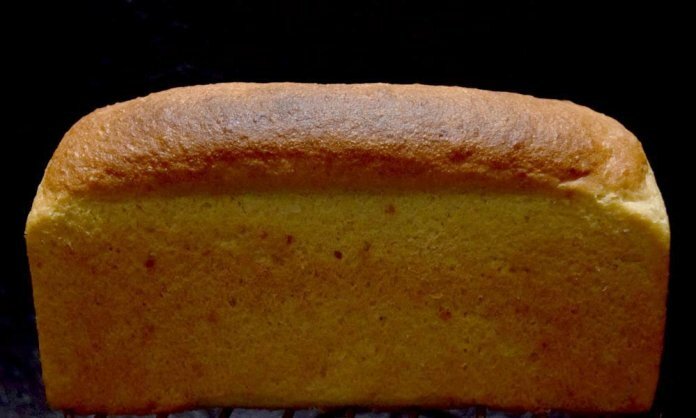 These health benefits are enough to encourage anyone to try this recipe of healthy sweet potato bread. For my recipe, I have used the yellow sweet potato that gave a wonderful color to the crust as well as the crumb. PS: While making bread, be accurate with your measurements and I recommend using a kitchen weighing scale while measuring your ingredients. First of all, take boiled sweet potato. Peel it and grate it. If you want you can mash it with the potato masher but I don’t want to take chance as while mashing, sometimes we still left with lumps. That is the reason I always prefer to grate the vegetable for my bread. Now using a weighing scale, weigh 150 gm boiled sweet potato. On the other side, in a jar, take lukewarm water (from the total mentioned amount of water in the ingredient list). Add sugar and yeast to it. Stir and let it rest for 5 minutes or until yeast froths. In case you don’t get any froth, discard that batch and start with new. I recommend using a good brand of yeast. I have used the Prime Active Dry Yeast for this recipe. For this recipe, I have used 300 gm of freshly milled whole wheat flour, 100 gm of all-purpose flour and 150 gm of sweet potato. Measure every ingredient mentioned in the ingredient list and keep it ready. One most important point, every ingredient should be at room temperature. In a bowl take flour, sweet potato, and salt. Mix everything. Add activated yeast solution. 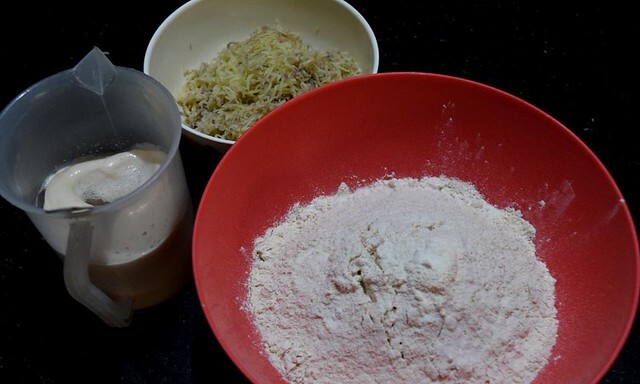 Start binding the flour by adding little water at a time. Because I have used freshly milled flour so it absorbed more water. However, you can add water accordingly. We need a soft and little sticky dough. Once the dough is ready, take it on the lightly floured counter. Add 1 tbs of oil to it and knead it for 5-7 min. 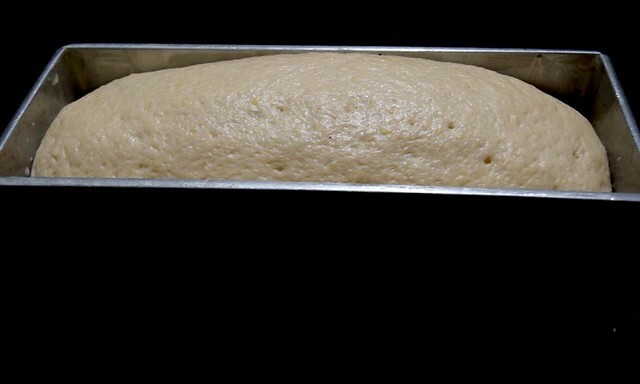 After this 5 min of kneading, you will notice that your dough has become soft, elastic and non-sticky. Now place the dough into a greased bowl and cover it with cling wrap or kitchen towel. Place the bowl at some dry and warm place. Let it rest until dough becomes double in volume. The moment dough becomes double in volume, take it out on the dusted surface and punch it to release the air. Using a rolling pin roll the dough into a rectangular sheet and then fold it to shape it as a log. Seal all the open ends well and place the shaped dough into a greased loaf tin (9x4x4 inch in dimensions) facing seam side down. Cover it with greased cling wrap and let it rest until dough rises to the rim. Meanwhile, keep your oven for preheating at 200 °C (with both the heating elements on) for about 15 minutes. Now brush the dough in the loaf tin with water and bake it in preheated oven for about 35 min. Because this is a vegan recipe so I haven’t used any animal product. But if you want then you can brush the bread with milk before baking. After 35 minutes, our bread will be ready. 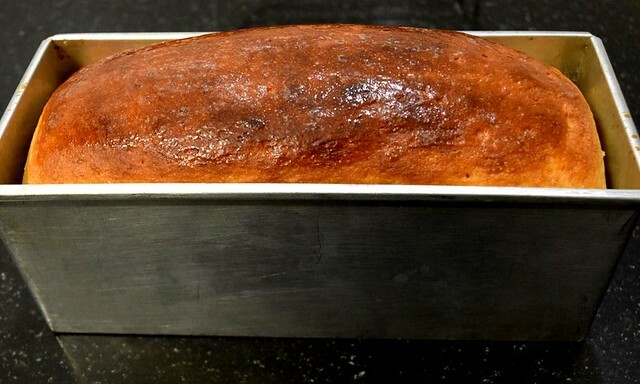 Take the loaf tin out from oven and demold the bread immediately else it will become soggy. 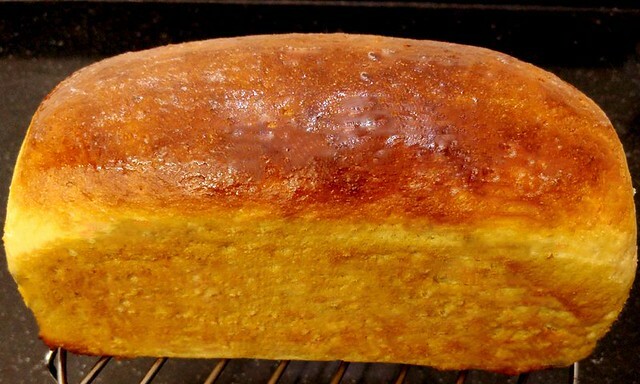 Place the baked loaf on a cooling rack and brush the top with olive oil. You can use butter as well as coconut oil to brush the top. Let the bread rest on cooling rack for a minimum of 2 hours. However, I prefer to bake bread late at night and then let it rest overnight. This helps to soften the crust as well as getting clean slices. So our Healthy Sweet Potato Bread is ready. This beautiful healthy sweet potato bread recipe is another addition to my list of bread recipes with vegetable extracts in it. Healthy sweet potato bread combines the health benefits of whole wheat and sweet potatoes in it. In a bowl add lukewarm water. Add sugar and yeast. Stir it and let it rest until it froth. In another bowl take flours, salt and sweet potatoes. Add yeast solution. 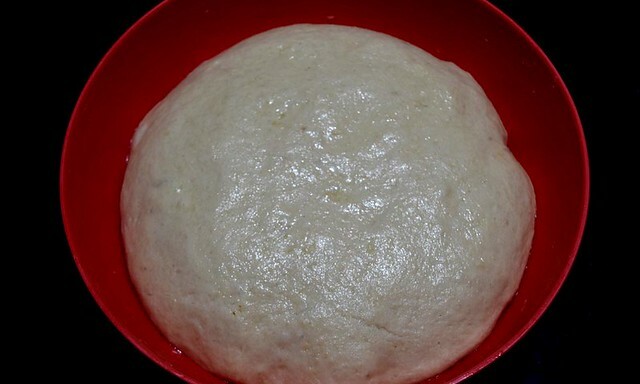 Start kneading the dough by adding water and prepare a soft dough. Take the dough on counter. Add oil and knead it for 5 min. After 5 min of kneading dough will become soft and smooth. Now place the dough in greased bowl and cover it with cling wrap. Place the bowl at a dry and warm place. Let it rest until dough becomes double. When dough becomes double, punch it to release the air. Using a rolling pin, roll it into a rectangular sheet and shape it like a loaf. Place the shaped loaf in a greased loaf tin facing seam side down. Cover it with cling wrap and let it rest until it again becomes double in volume. Brush the dough with water and bake in preheated oven for 35 min. When baked, take the bread out from oven. Demould it and place it on cooling rack. Let the bread rest for minimum 2 hrs before you slice. In case you don’t have brown sugar, you can use regular sugar. If bread is browning fast, cover it with aluminium foil and continue to bake. You can brush the dough with milk as well before baking. Water amount can vary depending upon the quality of flour. So adjust accordingly. Baking time can vary from oven to oven. How do we measure a loaf pan? From inside of the rim? Measure its dimensions from wall to wall. I love your healthy receipes. I constantly follow you dear. 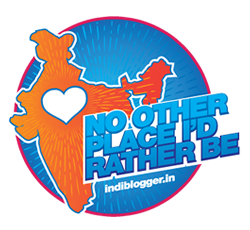 Thanks, Meenu for such encouragement. 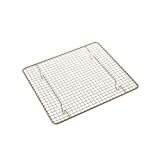 What are the dimensions of bread pan for above mentioned measurements? Please read the recipe. Everything is mentioned there.